Atop a building in the Bowery neighborhood of New York City, Meet on Bowery has three rooms: a penthouse loft, glass-enclosed breakout room, and an adjoining private roof garden. Step out of the elevator into the 7th floor penthouse that has been customized specifically for meetings. Our Meet Concierge will greet you in the morning and tend to your every need throughout the day, ensuring you have a seamless meeting experience. 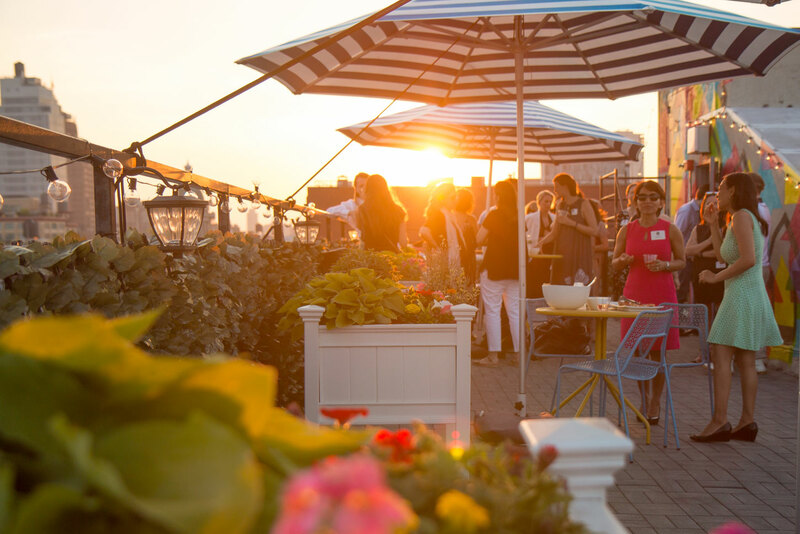 The roof garden touts ivy covered privacy trellises, luxury umbrellas, and comfortable bench seating. Pull up to vibrant cafe tables in our Hot Mesh chairs for meals or breaks, and enjoy panoramic views of downtown Manhattan and Brooklyn. Every corner of the venue is enhanced with our signature downtown edge and professional service to produce a deluxe meeting experience that your company will never forget. In a 2,500 square foot penthouse loft, unique feature elements include a street art-inspired drip wall, a living plant-based installation, custom tables designed with wallpaper from Flavor Paper in Brooklyn, and a calming ombre mural in the main meeting area. Large windows ood the room with natural light and illuminate exposed brick walls and stunning wooden ceiling beams. Amenities include a 65” monitor to display presentations. A separate meditation lounge showcases hand-painted Buddahs from Nepal, silk fabric draped from the ceiling, and cozy furniture in an area perfect for breakout groups or private calls. The street art-inspired drip wall energizes small groups and brainstorming sessions in this space. Amenities include sound hook ups and a 65” monitor for projections and screenings. Follow the arrow mural by street artist ABOVE to the garden-party inspired rooftop where open collaboration continues. Built-in sound system with customized playlists. Gotta have good tunes.